Some time ago I decided to make a tool to install Icy Phoenix locally without too much effort, I finally had a moment to finish it and put it up, and now I'll show you. 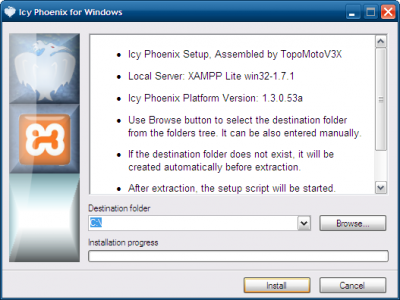 Based on platform XAMMP, Icy Phoenix setup will allow you to install with one click, a local host and Icy Phoenix board in less than 2 minutes. Click to Install and soon will open a page on your browser, where you can find log-in data for your local forum. Anyway, I have not testet it, but I am quite sure it would be usefull for some users. 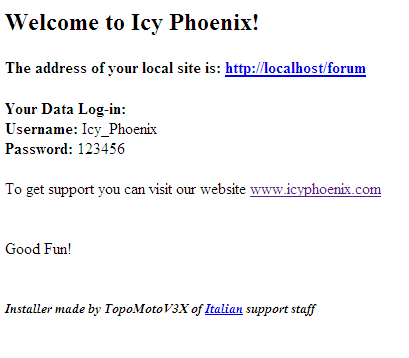 Do you think I can add it also on icyphoenix.de with german lang insite? Yes sure, we can add all the languages you want. I need you to translate this page in Spanish and German. Der Installer wurde von TopoMotoV3X (Italian support staff) erstellt. I did not translate this "Italian support staff" because everthing would awul. El instalador fue creado por TopoMotoV3X (Italian support staff). i am running into all sorts of troubles on windows 7.
on win 7 (x64) the best option is app serv. and delet the htaccess of icy then. means: install appserv and then install icy.